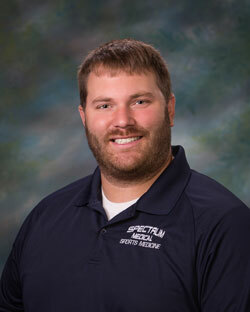 Brandon Owen is an athletic trainer at Spectrum Medical in Danville, VA. He assists the orthopedic doctors with casting, splinting, brace fitting and fracture reductions. Brandon also provides sports medicine outreach to Danville Public Schools. He graduated from Averett University in 2010 with a Bachelor of Science in Athletic Training. He has worked as a wellness program coordinator which included movement screening, application of corrective exercises and program design. Brandon then became the head athletic trainer at Hargrave Military Academy before taking his current position at Spectrum Medical. Brandon enjoys playing golf and is an avid sports fan.